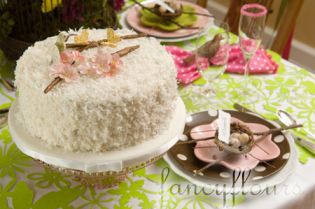 Stunning Spring Fling Table Ideas and Inspiration! Looking for a great way to spruce up an upcoming Spring tea party or luncheon? This table setting for a SPRING FLING about knocked me off my chair! I couldn’t choose which picture to post; they are all such great & beautiful ideas. I thought you might enjoy a shot of each! Again, I am blown away by two very talented ladies that put together this extravagant table. Marie Dorsey, owner of Two Sugars (www.twosugars.com) provided us with her outstanding lemon coconut cake. Look closely at the detail; she is truly amazing. Thank you to Marie! Nancy Quist, owner of Fancy Flours, Inc. (www.fancyflours.com) provided the handmade invitation, floral garlands, bird cage arrangement, & place settings. Find the plates used as place settings at www.fancyflours.com. With the right ingredients & creativity – the recipe is sure to be a success. Don’t reinvent the wheel! Try some of these ideas & then add you own personal flair to it. Think cupcakes, cookies and much more. Need more inspiration? Check out our online store & newsletter at http://www.fancyflours.com! Enjoy and happy baking. A big thank you for the incredible photography (Doug Loneman, www.lonemanphotography.com). Try using any combination of the breathtaking ideas above for a look that will be talked about for years to come! 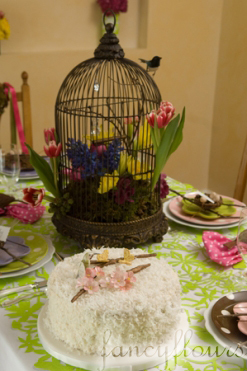 Photo 1: vintage birdcage, place settings, and Lemon Coconut cake (see recipe below). Plates for place settings can be found at: http://www.fancyflours.com. Plates come in daisy shape, set of 4 (purple, chocolate, lime green & pink). Polka dot plates, set of 4 (purple, chocolate, lime green & pink). Photo 3: Place setting with purple daisy plate and lime green polka dot plate. 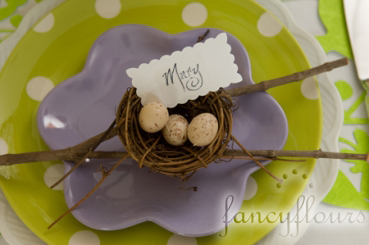 Place card holder made of assorted branches, mini bird nest, & artificial bird eggs. 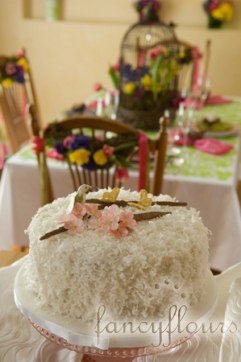 Photo 4: Detail of Marie Dorsey lemon coconut cake. 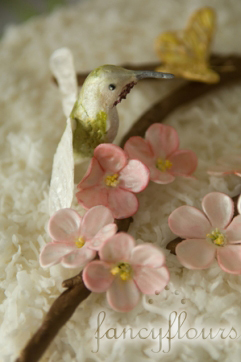 Stunning hummingbird, flower and branch. Once again, Marie’s work amazes us all! See more at http://www.twosugars.biz. Photo 4: Close up of cake with table setting in background. The two are quite the stunning pair! 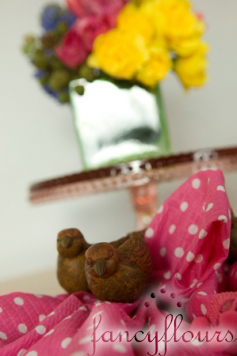 Photo 5: Darling handmade napkin with bird napkin rings. Photo 6: Cake with table setting. Used separately or together; equally beautiful! Photo 7: Detail of Marie’s Lemon Coconute Cake- look closely at the intricate detail on every piece! 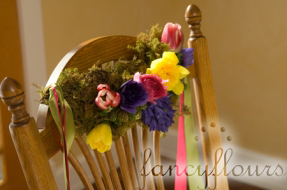 Photo 8: Handmade floral garland draped on chair. An idea that can be used for every season- pick flowers, leaves, berries and more to bring this beauty to life. Photo 9: Champagne Flute rimmed with pink sparkling sugar. Lemon Curd: In a stainless steel bowl placed over a saucepan of simmering water, whisk together the eggs, sugar, and lemon juice until blended. Cook, stirring constantly (to prevent it from curdling), until the mixture becomes thick (like sour cream or a hollandaise sauce) (160 degrees F or 71 degrees C). This will take approximately 10 minutes. Remove from heat and immediately pour through a fine strainer to remove any lumps. Cut the butter into small pieces and whisk into the mixture until the butter has melted. Add the lemon zest and let cool. The lemon curd will continue to thicken as it cools. Cover immediately (so a skin doesn’t form) and refrigerate until cold. The lemon curd can be made several days (up to a week) in advance. Makes one – 9 inch (23 cm) layer cake. Foster, Sara. ‘The Foster’s Market Cookbook‘. Random House. New York: 2002. This entry was posted in Baking Inspiration, Easter Treats, Instructions & How-To's, Spring Baking by Fancy Flours. Bookmark the permalink.